U.S. 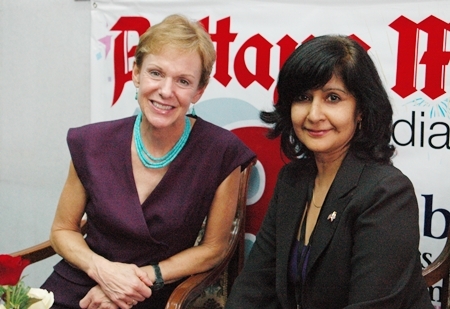 Ambassador Kristie Kenney paid a visit to Pattaya Mail Publishing Co., chatting with journalists on subjects ranging from American investments in Thailand to politics, human rights and the embassy’s outreach efforts for expatriates. 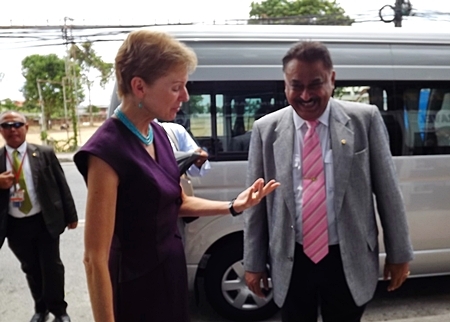 Managing Director Peter Malhotra greeted the ambassador and her staff May 3. He was joined by Executive Editor Dan Dorothy, Business Manager Tony Malhotra, General Manager Prince Malhotra, Pattaya Mail on TV Director Sue Kukarja and dozens of staffers. Pattaya Mai MD Peter Malhotra (right) presents a copy our book about HM the King’s birthday to HE Kristie Kenney, U.S. Ambassador to Thailand. The senior Malhotra briefed the ambassador on the Pattaya Mail’s 20-year history and presented her with a special edition of the newspaper. Dorothy gave Kenney an autographed copy of his novel “Mango Rains,” a true story set in Thailand. Following the formalities, Kenney took a few minutes to answer questions from Kukarja, saying the future for American companies doing business in the kingdom looks bright. The country’s strong infrastructure and quality workforce and receptive public have made the country a good hub for business in the Southeast Asian region. 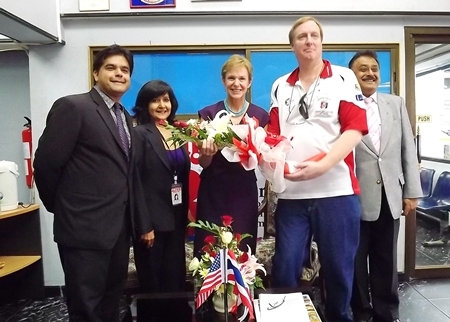 (L to R) Pattaya Mail on TV Director Sue Kukarja, HE Kristie Kenney, Executive Editor Dan Dorothy and MD Peter Malhotra thank the ambassador for her visit and talk. Kenney said she thought her biggest achievement since taking office was strengthening ties between Thailand and the United States both economically and culturally, citing work by the U.S. Peace Corps as an example. Opportunities for U.S. companies include cotton exports to the kingdom as well as in such fields as fashion design, movie animation, technology and music. “We also want Thai students to study in the U.S., so my job is to grow the friendship,” she said. Dan Dorothy presents the ambassador with a signed copy of his novel, Mango Rains. Retaining that friendship was her first priority on taking office, Kenney said, saying the bond between nations was strong. The key now is to make it relevant with regard to security, law enforcement and technology. A winner of many leadership awards related to inspiring and motivating people, the ambassador said learning the Thai language has not been as successful. However, she said, she continues to study. HE Kristie Kenney takes time out from her interview with Pattaya Mail on TV Director Sue Kukarja for a commemorative photo. One thing that has become easier over time has been operating in the political world as a woman. As for Thailand’s often tumultuous politics, Kenney said the kingdom is not dissimilar to many other countries. Her view hardened slightly when asked about the country’s troubled south, where Muslim separatists have waged bloody warfare with the government for seven years. HE Kristie Kenney, U.S. 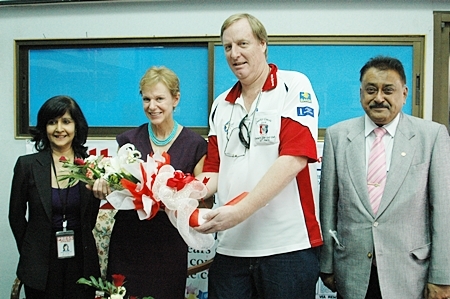 Ambassador to Thailand is welcomed to the Pattaya Mail offices by nearly the entire team. The country, she said is slightly more open to humanitarian aid, such as when it accepted 10 million dollars for flood-relief efforts last year. Help for American expats is also continually supplied, Kenney said, even if there is no American consulate in Pattaya. “We are very connected. There is a large community here, residents and visitors. 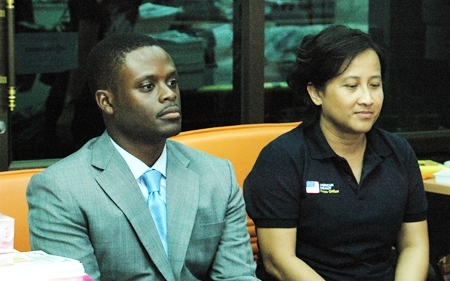 Our consular services office comes here three or four times a year and will be here again early June,” she said. Kenney noted American Consular Services can be reached on Twitter at @ acsbkk. She also has her own non-business Twitter account at @kristiekenney.